I was very lucky to attend the Women In Business Awards last night at the Crowne Plaza Hotel, Shawsbridge. I thoroughly enjoyed the night and was so inspired by the talented, hard working women all around me. A few days ago I walked into my Belle Dress Hire room and took a deep breath…… it’s not very often that I get to wear one of my own gowns and it was actually really overwhelming! I suddenly felt immense pressure as to which style I should pick and after trying at least thirty dresses on I finally made the commitment to this gorgeous black and white gown. I think the design inspiration behind this gown is a play on a typical tuxedo so a white, short sleeved, sequin top compliments the black, taffeta, mermaid skirt. The waist cut outs and open back ensure that the dress is feminine and elegant. I got plenty of compliments throughout the course of the evening and I have to say I did feel pretty fabulous! Initially, I did hesitate when choosing this gown as it wouldn’t be everyone’s cup of tea but to be honest I wanted to wear something that people may not have seen before and to showcase the diversity of styles available at Belle Dress Hire. This is a “statement” dress and does not require a dramatic hairstyle or any accessories, sometimes less is more! I felt it was best to compliment the gown with diamond studs in my ears and simply slicked my hair back into a low bun but I did add plenty of gloss spray just to give my locks a more polished look. 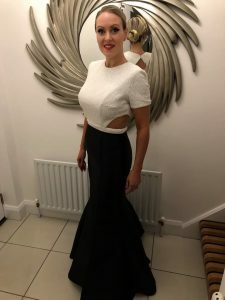 This entry was posted in Dress Hire Belfast and tagged belle dress hire, dress hire Belfast, Dress hire Lisburn, evening wear belfast, formal hire belfast by Leeanne. Bookmark the permalink.